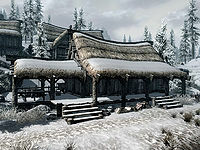 Rustleif's House is a smithy near Dawnstar's shoreline. Rustleif has his smithy and home set up facing the bay. He is a renowned weaponsmith, and he is often called upon to arm and outfit the jarl's men. His Redguard wife, Seren, assists him and is pregnant. Both Rustleif and Seren provide merchant services. There is a raised, covered porch in front and to the left of the door, with a couple of food barrels to the right and wooden benches to the left of the door. There are two sets of steps leading up to the porch and a snowberry bush beside one of them. On the side of the house the smithing setup is rather minimal, consisting of only a forge and a tanning rack and where they buy and sell their goods, although two smelters and a grindstone can be found elsewhere in town. The front door is novice locked during the day when they are both around the forge working and at night. The house is a single room dwelling that is a little spartan inside. Upon entering, on your left is a long wooden table and bench holding a bottle of wine, two bottles of alto wine, two bottles of Nord mead, a potato, a sprig of snowberries, several loaves of bread, a salmon steak, a cabbage and an eidar cheese wedge. To the left of the table, on the floor is a basket containing four chicken's eggs and to the right is a basket containing two leeks. Further to the right against the north wall is a set of shelves holding two leeks, a bulb of garlic, three potatoes, with several pieces of cheese on top. Above these shelves are two garlic braids, three bunches of elves ear and a bunch of frost mirriam hanging from the ceiling. There is a food barrel in the northeastern corner. Against the east wall is an unlocked chest containing minor loot, beside a large double bed with a pair of shoes by the foot of it and a basket containing two potions of vigor to the right and a round wooden table beside this holding two bottles of Black-Briar mead. Next to this against the south wall is a tall wardrobe with a blacksmith's apron on top and pile of firewood, with a hang rack holding three rabbits between them. Opposite the door, on the south wall is a fireplace with a cooking pot in front and a steel sword on the mantlepiece. In front of the hearth is an iron shield. To the right of the fireplace are several barrels and against the west wall is a square wooden table and two chairs. On the table is a medium coin purse, an iron dagger and five loose coins.